/Private & Group Chat /How Can Admin Control Chat Content Deletion in Mangoapps? a. No one can delete messages – Selecting this setting, no individual chat conversation cannot delete his/her message, even if they are network admins. b. User can delete own messages – Selecting this setting, the creator of messages in an individual chat conversation can delete his/her own message. You cannot delete other people messages, just your own. a. No one can delete messages – Selecting this setting, no participant in a group chat conversation can delete messages, even network admins are not allowed to delete messages. b. 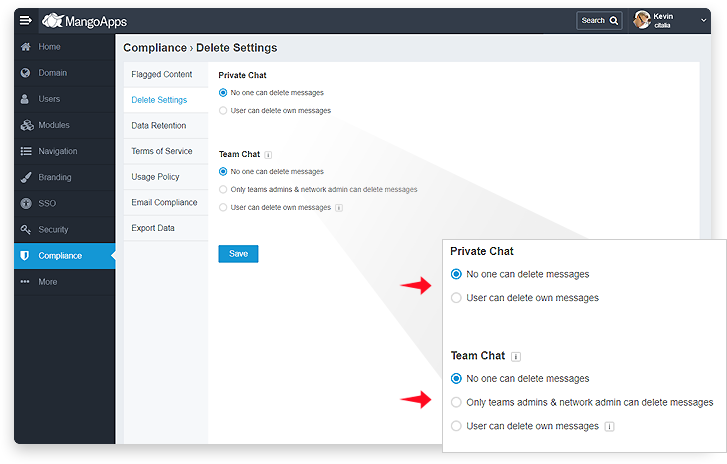 Only teams admins & network admin can delete messages – Selecting this setting, only the team admins & network admins can delete the messages inside a chat conversation. c. User can delete own messages – Selecting this setting, all participants of the group chat conversation can delete his/her own messages. Team admins and network admins can delete any and all messages in the group.